The set constructions I've considered so far --- things like , , --- have involved finite numbers of sets. It's often necessary to work with infinite collections of sets, and to do this, you need a way of naming them and keeping track of them. Definition. Let I be a set. A collection of sets indexed by I consists of a collection of sets , one set for each element . You could make this more precise by defining a collection of sets indexed by I to be a function from I to the class of all sets. I'll stick with this informal definition, since it won't cause us any difficulties in what we do. Note that ; some of the sets in the collection may be identical. This would not be very interesting if I were only considering finite collections of sets. Here are some infinite collections of sets. In general, if n is a positive integer, then . In general, consists of the integers which are divisible by n.
For instance, I have sets , , , and so on, one for every real number. Since is uncountable, I can't list the sets in this collection the way I could list collections of sets indexed by . Definition. Let I be a set, and let be a collection of sets indexed by I. 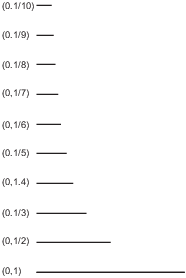 The collection of intervals is shown below. They actually lie on top of one another on the x-axis; I've "pulled them up" so you can see them separately. (a) I will show each set is contained in the other. Let . Then for some . This means that . Now implies , so . Hence, . Conversely, suppose . Now , so by the definition of union, . This proves that . (b) Since the empty set is a subset of any set, I have . The opposite inclusion is . To show this means to show that contains no elements. I'll give a proof by contradiction. Suppose on the contrary that . By the definition of intersection, this means that for every positive integer n.
But this means that , contradicting the fact that for every positive integer n.
This shows that there is no such element c, so the intersection is empty. First, I'll show that the left side is contained in the right side. Let . I have to show that . Therefore, . This means that . Hence, . Next, I'll show that the right side is contained in the left side. Suppose . I have to show that . Intuitively, if all the 's stayed to the left of x, then their limit couldn't be greater than x, so the limit couldn't be 1. This means that . By the definition of union, . Therefore, . Since I've proved both inclusions, I have . I'll show that each of the sets and is contained in the other. I'll do the easy inclusion first. Let . Then . Therefore, for all . By definition of intersection, . I have to show that . Suppose on the contrary that . But this contradicts the fact that for all . Intuitively, since , if then eventually the 's must shrink to the left of x. If all of them stayed to the right of x, the limit would be greater than or equal to x, so it couldn't be 3. This proves by contradiction that . Since I already know that , I have , or . Together with the first inclusion, this proves that .